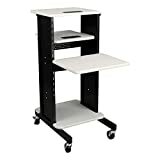 Laptop carts are now being used in many classrooms, and workplaces. With such a rising demand, our team believes that it’s about time to shed some light on the top 10 best laptop carts in 2019. Read below to learn about the products and discover their desirable features. Have you ever been in a situation where you want to utilize your laptop, but struggle to balance it on an uneven surface? No more worries because this product is here to solve your difficulty. This Ergotron Neo Flex is a mobile friendly cart for workers, which can be moved around smoothly with 4 wheels. And, it is effortlessly flexible. This cart is very easy to assemble. Its base is 12 – 17 inches wide, which makes it the perfect size for a laptop to be put on. Plus, the wheels glide smoothly on almost every type of surface even if it is carpeted. Ergotron Neo Flex 24-205-214 is up online with a protection plan. A little bit on the pricey side however, yet we can guarantee that the Ergotron Neo Flex is worth every single penny. Classrooms can be challenging sometimes when you want to do presentations and your laptop cart could not make it stand properly in a well-mannered way. 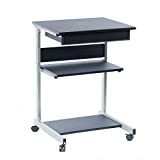 The laptop cart from Norwood Commercial Furniture does not only provide you a classroom friendly equipment, but it also saves a lot of space for you. It is designed with a dimension of 40 inches high and 19 inches wide. And, it comes in two different colors, giving you the choice to pick what best matches your preference. 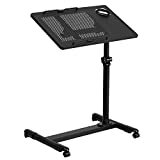 The cart is made of steel, which is very durable, making this cart able to carry a lot of weight such as a CD player, books and your projector all at the same time. Best yet, this smart cart comes with a 6-outlet power strip and 10 years warranty. So next time my friends, no more shaky laptops to ruin your confidence on your speeches. We believe that innovative people like you do not only want simple ordinary product to represent you, but only innovative products do which is why the RoomyRoc Mobile Laptop Desk is designed for people like you. This item is very innovative which can rotate 360 degrees up or down and the height is adjustable. The cart is equipped with an amazing rolling desk. So, you can utilize it both at home and office. 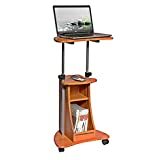 If big computer desks are stressing you out, this computer cart on wheels will serve you best because it can be used as a laptop desk, cart and stand. Having a good quality product combined with a good look also gives you extra confidence carrying it around. That is why the Tatkraft comes with a modern looking design, and the table can be tilted for comfortable usage. It is (51.5-83cm) meaning we can adjust the height, which is very convenient, and it is 60x40cm wide. This desk cart lays comfortably whether you are using it from a gaming chair or your bed. It is made out of steel and high quality MDF and can be easily assembled just by reading the manual and using the tools in the box which is absolutely smart and simple. It is common that everyone works on computer nowadays. Therefore, it is our primary concern that you work on it and can maintain comfort posture at the same time. 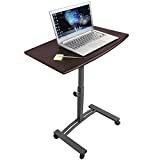 That is why this computer desk allows you to work on your computer sitting or standing and even laying on your bed. 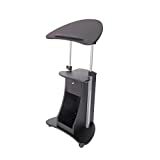 e-Joy mobile & compact computer cart helps you to obtain a better posture as well as reducing physical pain from using your devices. This item weighs 28.8 pounds, and it is 27x20x6 inches. Plus, you can request for the warranty. While your computer is doing the work for you, it is common that the computer heats up. We care about your computer, which is why the Flash furniture invented a stunning product with portable design. This computer desk comes with a vented surface which eliminates your fear of having an over heated laptop from over using it. It comes with a tiny basket you can use to hold up your pens and pencils. This product weighs 13.4 pounds and 24.5x20x4 inches. It is perfect for people who spend long hours on their laptops. No more hot laptops for you starting from today with the Flash Furniture computer desk. Have a tiny space to store items in your home? The Techni mobili comes with rolling on casters for safety storage as well as a scratch-resistant steel frame. It is a single drawer, but there are two shelves for storage cart. The drawer can hold up to 10 lbs; the top shelf 50lbs and bottom 70lbs. Its color is graphite and weighs 28 pounds. This cart is 22 x 20 x 31 inches perfect to store heavy objects and very dorm room friendly for all fellow students. Another product from techni mobili that is made out of heavy-duty engineered wood panels and anti-scratching material. This product is also equipped with a practical edge-stopper to make sure objects won’t slide down when the table is being tilted. You can easily adjust the height to your needs as well as conveniently open and close the storage compartment. The closed storage shelves bottom and top each has a 20 pounds weight capacity. The wheels are perfectly smooth-rolling which makes this product perfect for classrooms and home. It is 21.5 x 15.5 x 45 inches and weighs 27 pounds. All things go right with this one. Tiny but smart, this product from Techni Mobili is crafted from MDF wood panels, anti scratch material and can easily adjust the table height from 28 to 43 inches. It comes with a handy storage compartment and can hold up to 22 lbs. Considering the fact that this model is so flattering yet so sturdy and durable, it is worth a try. This computer cart is 22 x 16 x 44 inches and weighs 16 pounds. Space saving and good construction, what else do you ask for? Best thing is you receive a warranty up to 5 years as well. Are you someone who wants things to go your way? Presenting you the Seville Classics, this guy comes with four 1.5 inch caster, which you can smoothly move around your home and your dorm room. 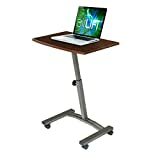 The height is adjustable, allowing you to use the cart both standing and sitting, and the construction makes the desk sturdy but light in weight. It is 24 x 16 x 33 inches big, and weighs 11 pounds. On top of this, you will also be receiving a 12 months warranty from the manufacturer for this purchase as well. We have just gone through the top 10 best laptop carts in 2019. These ones have received stellar reviews, and are guaranteed to never disappoint. Get your favorite one soon while stocks last.